Your chance to see Richmond’s fishing industry up-close and personal. 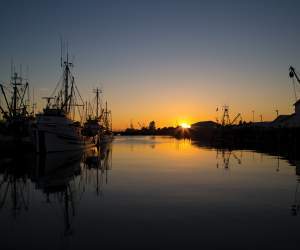 Along the pier next to Steveston Landing is Fisherman’s Wharf, where incredible river views give way to the village’s famed commercial fishing fleet—the largest in Canada. The catch of the day is unloaded here for sale, and you can buy shrimp, Dungeness crab, sea urchin, and spot prawns from the very anglers who caught them. While the public fish sales float is always open, fishing vessels keep their own hours and come and go as they please, so you never know what will be on offer! Check out the Steveston Harbour Authority’s website to learn more. Let your tastebuds guide you on a trip around the world of food.